The company's highly ambitious premium series is finally here. Vizio today announced the arrival of its ultra-premium Reference Series. The company's flagship lineup was first announced during CES 2014 in Las Vegas, Nevada, but until today the R-series has remained an elusive, unicorn product for cinephiles and A/V junkies. The Reference Series delivers High Dynamic Range and Dolby Vision. The Reference Series will be available in 65- and 120-inch screen sizes, though no pricing has been confirmed yet. The company made some very big claims about this series when it first debuted, promising best-in-class picture quality and next-generation hardware. According to Vizio, the Reference Series is one of the first UHD (4K) lineups to promote High Dynamic Range and Dolby Vision compatibility. Like Vizio's other 2015 models, the Reference Series televisions wield a Full Array LED backlight scheme with up to 384 dimming zones—compare that to the 32 zones of the company's new M-Series. In 2014, Vizio claimed massive color abilities—a color space called "Rec. 2020"—that so far no manufacturer has been able to achieve. 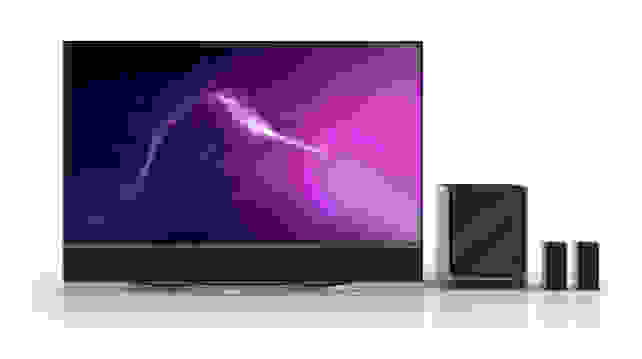 Today's announcement appeared to scale back expectations a bit, instead gunning for the Ultra-Color Spectrum, which may or may not exceed the color abilities of this year's Quantum Dot-equipped UHD televisions. The new Reference Series marks Vizio's ultra-premium, top-of-the-line UHD entry for 2015. The 65-inch Reference Series TV will come bundled with an integrated 5.1-channel sound bar, but anyone courting the gigantic 120-inch version will hopefully already have a wired-and-ready home theater to accompany it. While many manufacturers have claimed specular highlight abilities of 1000 nits (or brighter), Vizio seems a bit more reserved, citing a peak of 800 nits for the Reference Series. And as a Dolby Vision-equipped set, that will likely come in handy. We'll have to wait until we have the set and appropriate content to go with it, but Vizio claims that several compatible Warner Bros. movies will be available when the series launches. Content capable of Dolby Vision should be available alongside the Reference Series. The company also confirmed an "effective" refresh rate of 240 Hz, which probably means 120 Hz native. According to Matt McRae, Vizio's CTO, the Reference Series will "shatter the limits of what's possible for cinephiles." Naturally, both TVs in Vizio's Reference Series will be smart and equipped with all of the latest codecs and hardware measures to allow native 4K playback and 4K streaming from app partners. No pricing information for either TV has been announced, but interested consumers can sign-up for updates on Vizio's website. Stay tuned for our first impressions and full review of Vizio's long-awaited Reference Series. Source: IRVINE, CA - April 13, 2015 - VIZIO, the maker of the top-selling Ultra HD TV1, introduced today details behind the industry's first-ever line of High Dynamic Range Ultra HD TVs to support Dolby Vision - the VIZIO Reference Series Ultra HD Full-Array LED Smart TVs - available in 65" and 120" class screen sizes. The result of a decade of knowledge in pushing the boundaries of picture and audio quality, the beautifully designed VIZIO Reference Series is packed with groundbreaking, innovative technologies. Equipped with Dolby Vision for a dramatically different visual experience and Ultra-Color Spectrum for a wider color gamut, the Reference Series displays stunningly beautiful Ultra HD detail with over eight million pixels in every image. An 800-Nit, Full-Array LED backlight and 384 Active LED Zones create a stunningly vivid Ultra HD picture with striking contrast. Several 4K Ultra HD Dolby Vision titles will be available from Warner Bros. streaming through VUDU, Walmart's video-on-demand service for movies and television. When combined with the integrated 5.1 sound bar system on the 65" model, home theater aficionados will not only enjoy unprecedented cinematic picture quality, but a powerful home audio experience that delivers a Sound Pressure Level of up to 101dB. The 2015 Reference Series was designed for the cinephile, pushing the boundaries of brightness, color and contrast and featuring an integrated home theater system to perfectly round out the consumer experience. A Full-Array 800-Nit LED backlight makes for an incredible picture, enabling a wider and more dynamic range of luminance with an unprecedented 384 Active LED Zones for precise contrast control. Clear Action 1800 is set by a whole new standard that allows consumers to enjoy fast-action sports and movies with superior motion clarity thanks to powerful image processing and blazing 240Hz effective refresh rate. The new VM50 Ultra HD engine, a dedicated Ultra HD motion and picture-processing engine, provides enhanced clarity in every Ultra HD image. for sharper detail and ensure fast moving scenes appear clearer than ever. "The Reference Series redefines 'best-in-class' picture quality and audio standards," said Matt McRae, Chief Technology Officer, VIZIO. "We leveraged our deep understanding of the consumer experience to fuel innovative technologies that take critical drivers of picture quality - like color and contrast - to new levels, transforming long-existing standards. Packed with breakthrough achievements like High Dynamic Range and Ultra-Color Spectrum for a wider-than-ever color gamut, the Reference Series shatters the limits of what's possible for cinephiles. The addition of an unbelievably powerful integrated 5.1 audio solution with a 10-inch wireless subwoofer and two rear satellite speakers further reinforces that the VIZIO Reference Series delivers the most immaculate home theater experience possible." Unlike most TVs, which can only reproduce a limited color gamut of Rec 709, the Reference Series features an Ultra-Color Spectrum which widens the color gamut, rendering colors closer to the range a human eye can see, something never before possible on a home TV screen. Taking advantage of this capability, Dolby Vision content on the Reference Series delivers captivating color, astonishing brightness and a contrast range with brighter highlights and deeper darks. This complete High Dynamic Range solution more accurately reproduces the nuances in every picture, revealing fine details found in real scenes that are brought to life on the VIZIO References Series. "We are proud for Dolby Vision to be introduced to consumers through the VIZIO Reference Series, providing a dramatically different visual experience that engages the senses and further draws viewers into the picture," said Giles Baker, SVP, Broadcast Business Group, Dolby Laboratories. "VIZIO Reference Series customers will have access to a slate of 4K Ultra HD Dolby Vision content, bringing viewers closer than ever before to viewing content as it was intended by filmmakers." On top of redefined picture quality, the VIZIO Reference Series gives consumers access to unparalleled Ultra HD streaming with an initial slate of Warner Bros. 4K Ultra HD Dolby Vision titles that will be available through VUDU, a leader in quality over-the-top (OTT) video for digital movies and TV.The content-delivery service will deliver easily accessible Dolby Vision content in 4K Ultra HD to enable the ultimate home cinema experience. Consumers can find an ongoing list of upcoming Warner Bros. titles in Dolby Vision at VUDU.com/UHD. "Customers expect VUDU to use the latest technology to create a cinema-quality experience and thanks to Dolby and the VIZIO Reference Series, it's now possible," said Scott Blanksteen, Vice President of Product, VUDU. "The most advanced home entertainment experience is now a reality and we couldn't be more proud to be the service sharing content with consumers." Equipped with blazing fast 802.11ac dual-band WiFi for a fast, efficient streaming experience, the Reference Series features VIZIO Internet Apps Plus®, offering entertainment enthusiasts Dolby Vision playback capabilities through VUDU and also instant access to Ultra HD content through other apps2 including Netflix, Amazon Instant Video, UltraFlix and Toon Goggles3. Supported by the HEVC H.265 codec and powered by the VIZIO V6 six-core processor, the Reference Series provides consumers with seamless discovery and organization of apps. For sports, movies or TV shows only available to consumers in 720p and 1080p, the Reference Series is equipped with a powerful Spatial Scaling Engine, which beautifully transforms the ordinary pixels to finer, more accurate Ultra HD pixels, sharpening details to provide an all-around better viewing experience. The Reference Series supports future ready HDMI ports to ensure consumers using next generation cable and satellite receivers, Blu-ray players and game consoles, won't miss out. The Pure Cinema Engine displays frame rates at an authentic 24 frames per second, giving movie-loving consumers the exact experience filmmakers intended. Additionally, the Reference Series is also great for gamers, with a High Velocity Mode that triggers an explosive 120 frames per second for legendary gaming speeds with high responsiveness and low latency. If the best picture quality with the most innovative technologies isn't enough to entice consumers to upgrade, perhaps the high-end design or integrated 5.1 Sound Bar System will do the trick. Reference Series sets an industry standard for beauty and marks a breakthrough achievement for integrated home theater audio in the 65" class model. From the near edge-to-edge display and ultra-thin bezel to the aluminum frame and precision crafted base, each detail is meticulously produced from select materials. The innovative integrated sound bar built into the base of the 65" model is supplemented by a powerful 10" wireless subwoofer and two rear satellite speakers. The audio experience is further enhanced by top-of-the-line audio technologies from Dolby and DTS™, including over 101dB of crystal-clear sound with less than 1% harmonic distortion4. To find the right fit for any home theater, the Reference Series enables a modular configuration, allowing consumers to install the TV with or without the sound bar, setting the stage for the ideal custom home theater entertainment environment. Customers interested in the VIZIO Reference Series Ultra HD TV can sign up to receive email updates on the product and browse additional information at VIZIO.com.